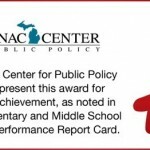 Bates Academy recently received an “A Grade” on the Mackinac Center’s newly released 2015 Elementary and Middle School Context and Performance Report Card. The A grade recognition was given to the top 224, or top 10 percent of, schools ranked. Mackinac Center’s report card’s “CAP Score” adjusts the most recent three years of MEAP Grade 3 through 8 assessment scores based on expected performance according to a school’s free lunch student population. Read the publication for full details about Mackinac Center’s Elementary and Middle School Context and Performance Report Card, at www.mackinac.org/22171. This entry was posted in Info News Center, News and Press Releases, Student Showcase and tagged 791.